To make sure the new flat-pack furniture and were left with something barely resembling the furniture in the showroom and a hand-full of space parts and screws, you need the help of professionals. We have been assembling wardrobes, beds, tables and other flat-pack furniture from IKEA and other retail shops, always delivering great looking furniture. 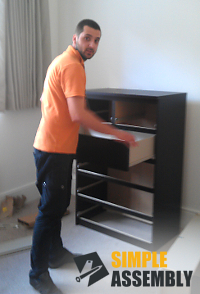 Our furniture assembly Enfield EN1 services are performed by knowledgeable professionals. Our years of experience guarantee you will receive high quality customer services without breaking the bank. You can book flat pack furniture assembly at your convenience. We offer a wide selection of booking opportunities, that will fit even the busiest schedule. Order a service with us Mondays to Sundays and evenings, we have 24/7 availability and offer flexible scheduling options. And to make sure your new piece of furniture will be safely delivered at your door and you will not have to wait for the movers for hours, book our furniture delivery service. Remember to ask us about the additional discounts we offer on combined bookings. Pick up the phone and dial 020 3404 5905 now! Talk to our customer care representatives about great services we offer, and receive free, no-obligation quotes. Alternatively, use our live chat to get more information on our service while online, and if ready to order Enfield EN1 furniture assembly, fill in our online booking form.